In the era of tiki taka and false nines, the classical poaching striker is almost nonexistent. The striker has to be an all-rounder who can hold the play, drift wide to create space and be extremely fast so that he can latch on to through-balls. Fernando Torres has all these attributes and much more, thus making him one of the best number 9s today. At his best, he is almost unstoppable and can terrorize the best of defenses. For someone who started off as a goal keeper, Fernando Torres has evolved incredibly to become one of world football’s most feared strikers. As a kid, he started out in Mario’s Holland and later joined Rayo 13. His exploits for Rayo gained the attention of Atletico Madrid, for who he joined the youth system at the age of 11. He soon made his debut in the 2000-01 season and plied his trade in the Segunda division for 2 seasons before being promoted to La Liga. In his very first season in the top tier of Spanish football, he scored 13 goals. The next season would be even better as he scored 19 goals becoming the third highest scorer in the largely competitive league. He started getting recognition at the international stage too as he emerged as the highest scorer for the Spanish team at the 2006 World Cup. A couple of years later, Torres left Atletico and signed for Liverpool for 25 million pounds. What followed was sheer magic in Merseyside - he became the first striker to hit 20 goals in his first season for Liverpool since Robbie Fowler. His form continued in the European Championships where he scored the sole goal against Germany in the final, a typical Torres goal running behind the defense to coolly slot the goal. The next season would be even more successful as Liverpool gave Manchester United a run for their money and seemed close to winning the title, eventually losing out by 4 points. In the 2009-10 season Torres would go on to become the fastest Liverpool player ever to reach 50 goals. He was also part of the world cup winning Spanish side in 2010. The failure to play in the Champions league for a player of such immense quality meant that there were clubs looking to sign him. Torres pledged his commitment to the club and the new manager Roy Hodgson. But with Liverpool being nowhere in the reckoning for a top 4 spot in December, Torres shockingly moved to Chelsea for a British transfer record of 50 million pounds. The first 6 months in Chelsea were nothing to write home about as he scored only one league goal. More of the same would follow as till date Torres has not recaptured his prolific Liverpool form or his consistent Madrid form. Ironically though his spell for Chelsea would see him win 2 major trophies - the Champions League and the Europa League in succession - with Torres having a pivotal role to play in the latter triumph. In his most prolific year, 2007-08, Torres won a host of individual awards. He was named in the PFA Team of the Year and was Player of the Month in February 2008. The dream season climaxed at the Ernst Happel Stadium in Vienna in the summer when he scored the only goal in the final of the European Championships helping Spain lift the trophy. He was named in the Team of the Tournament by UEFA. He also placed third in the Ballon D’Or awards later that year. He was also a part of the Spanish team that went on to win the 2010 World Cup in South Africa. Although, he’d dropped off the pace by the time the next edition of the Euros came around in 2012, his uncanny knack of scoring goals didn’t leave him and he ended up with the Golden Boot for the tournament. He currently sits third on Spain’s all-time goal scoring charts. It was on Torres’ grandfather’s insistence that he joined Atletico Madrid. It was his dream to see his grandson play in the red and whites at the Calderon. Torres was made club captain at the age of 19 and was made Atletico’s idol in residence. Years before joining Liverpool, Torres and his friends went out to get tattoos with Liverpool’s slogan, ”You’ll Never Walk Alone”. Torres, however, couldn’t get one owing to the public nature of his profession. He ended up having to make do with an armband bearing the slogan. In Chelsea’s clash with city rivals, Tottenham Hotspurs, in September this year, Torres was involved in an altercation with the Belgian defender, Jan Vetonghen. Torres was captured on television cameras clawing at Vertonghen’s face. Although the act went unnoticed by referee, Mike Dean, Torres was sent off later during the game for two separate yellow card coming togethers with the same opponent. It was only the Football Association’s limitations of retrospective action that allowed Torres to escape a lengthier ban than the mandatory one match. Since his 2011 move to West London, Torres has become the subject of much derision. His record for Chelsea pales in comparison to his record in Liverpool. Theories have been put forward to explain the previously mercurial striker’s apparent loss of form. None have been very convincing. Torres has even been dropped from the Spanish squad and now faces an uphill struggle in making it back. 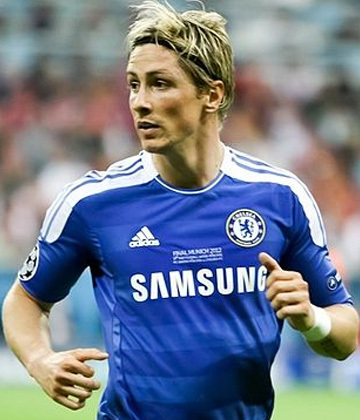 The form of other Spanish strikers is cause for concern for Torres’ bid to go to Brazil. Only a season reminiscent of 2007-08 will see him recapture that place he covets.